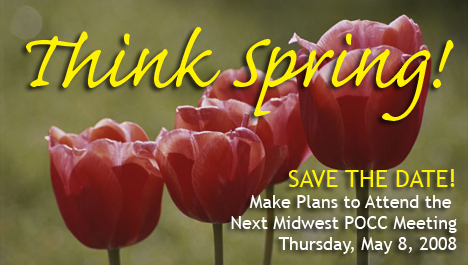 The Midwest POCC Membership List is Now Posted...Click here! The Midwest POCCs provides a forum for the discussion of ideas, issues, practice, and emerging technologies unique to POCT. Notice to Corporate POCT Professionals (Vendors) The Midwest POCC meetings are open to Point-of-Care coordinators and other professionals involved in POCT. Our purpose is to partner with other Point-of-Care professionals in the community to provide a forum for an open discussion of program practices, ideas, issues, emerging technologies and adherence to regulatory guidelines. Corporate POCT professionals are welcome and encouraged to attend meetings as participants. This is an ideal venue to network with point-of-care coordinators, to hear the thoughts of this small but growing community and to partake of an educational opportunity. The Midwest POCC group is grateful to Corporate POCT professionals who generously sponsor our meetings by providing lunch, speakers, and other items. To keep the Midwest meeting an open forum without competition, we discourage the display of products by corporate professionals, except during the Midwest POCC Vendor Fair or unless specifically requested to do so. We appreciate your cooperation with this request and look forward to seeing you at future meetings.